Chef is cooling Delverde bowtie pasta in ice water. Photos by Yours Truly. MENTION carbs and the average person in the United States thinks of two things. One is weight gain. The other is PASTA. What a shame that a delicious and nutritious food source has gained such a bad reputation over the last 15 to 20 years. Hoping to reclaim pasta’s good name are the good folks behind Delverde. The central-Italy based pasta maker has hit the road in the name of pasta. Its travels have brought it to New York City and Westchester through 24 July where it is conducting “Pasta Sommelier." Simply put, “Pasta Sommelier”is a one-hour cooking class and tasting. In just 60 minutes, attendees can walk away knowing some important things about good pasta. For one, good pasta has a more durable texture than one of a lesser quality. 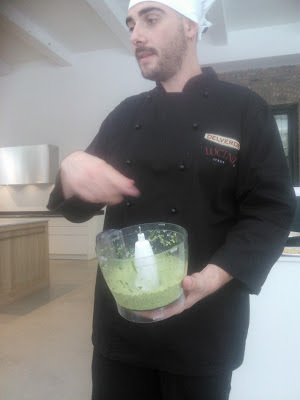 Delverde chef showing the greeness of basil in pesto sauce. Also note that good pasta does not cause the weight gain that myriad diet books have railed against because it does not contain simple carbs. High-quality pasta contains the complex carbs that stick to your ribs, staving off hunger for longer than an hour or two. 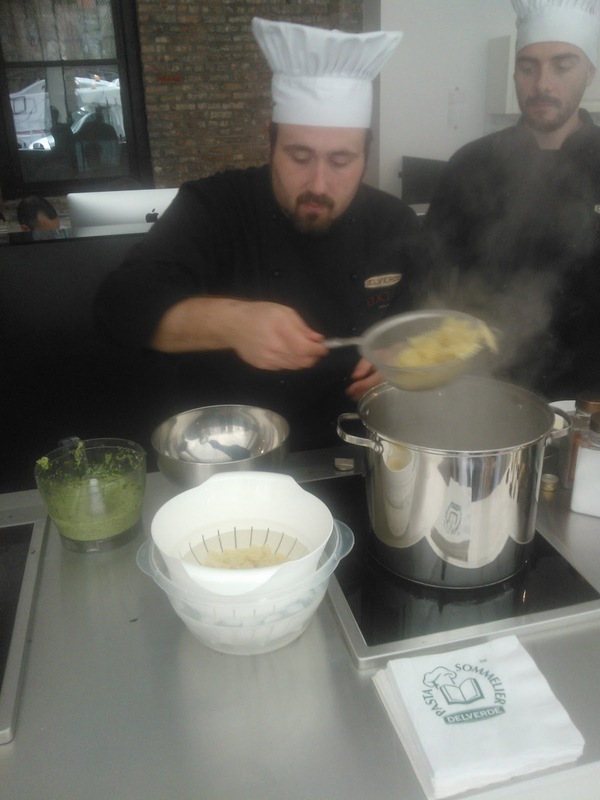 Visit http://www.bit.ly/1c4CsNy to learn more about “Pasta Sommelier” and to sign up for a class.